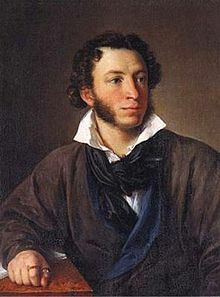 Alexander Pushkin (1799-1837) was born in Moscow into a noble family. He excelled in poetry, short stories, plays, and novels. He quickly rose to be the most outstanding writer of the Romantic period in Russia, Russia's greatest poet, and some say the father of Russian literature. Even so he was always viewed with suspicion by the imperial police. Pushkin fought in dozens of duels to defend his easily offended honor and was shot and killed in a duel at the age of thirty-seven. This short story was one of five published in The Tales of the Late Ivan Petrovich Belkin. The story not only features a series of painting depicting scenes from the parable of the Prodigal Son handing on the wall of the station house, its plot features a father whose daughter runs off to a far country. To read the text of Pushkin's short story, "The Stationmaster," please click here. 1) What was a “stationmaster”? 2) Does the introduction elicit contempt or compassion for the stationmaster? does the narrator/traveler experience/learn on each visit? 4) What is the significance of the paintings of the Prodigal Son hanging on the station wall? 5) Was Dunia “kidnapped” or did she “escape”? 6) How is Samson like and/or unlike the father of the parable? Why is he called “Samson”? 7) What is the effect of the indirect narration (through Samson and the peasant boy Vanka)? 8) Who is “at fault” in the short story? Dunia? Minskii? Samson? Explain your answer. 9) How is the short story like and/or unlike the parable? Explain.